The above 58th verse of the first chapter of the Sai Satcharitra, written by Govind Raghunath Dabholkar- alias Hemadpant rightfully emphasizes the significance of close association with Sadguru or his company. The Shirdi Rasyatra was the first such occasion where hundreds of Shraddhavans were blessed with the opportunity to be with their Sadguru. Going on a pilgrimage is considered important in Indian culture and tradition. Moreover, a holy pilgrimage becomes bliss when you get the opportunity to travel with your Sadguru. Many Shraddhavans received a chance to go on five such pilgrimages- viz. four Rasayatras and one Bhavayatra along with Sadguru Shree Aniruddha. Sai Samartha Vidnyan Prabhodini organized the four Rasayatras to Shirdi, Akkalkot, Dehu-Alandi, and Goa. In these Rasayatras, the Shraddhavans, under the guidance of Sadguru Shree Aniruddha, made a vow to gather this Bhaktiras (the core essence of Bhakti) from this Rasyatra and savour it. In fact, the name ‘Sai Samarth Vidnyan Prabhodini’ itself has been derived from these four Rasayatras. Sai from Sai Baba of Shirdi, Samartha from Swami Samarth of Akkalkot, Vidnyan means the Saint Dyaneshwar and Tukaram, and Prabhodini from the Shiva or Mangesh, who imparts morals and devotion to the devotees along with his consort, Shantadurga. The Rasayatras were also explicitly organized in the above order. The four Rasayatras were followed by one Bhaavyatra to Pandharpur. The saints, firmly anchored at Vitthal’s feet, having deciphered the principle,’भाव तोचि देव’ (Experiencing his love, is, in fact experiencing him. So bhava is in fact him), have selflessly distributed their Bhaktibhaav(love and devotion) towards God to all through their compositions. The Bhaavyatra was organized under the guidance of Sadguru Shree Aniruddha, to Shreekshetra Pandharpur, the place where the purest sentiments of all the saints flow towards Shree Vitthal’s feet. Among the four Rasayatras, the first was arranged to Shirdi. Sadguru Aniruddha has clearly stated in the Srimad Purushartha Granthraj that Sai Baba is His Digdarshak Guru (A Guru who is the guide) as well as has repeatedly said that the Sai Satcharitra is not only the story of Sai Baba, but also of his devotees. To savour this Rasa of Sadguru’s devotion from Saibaba’s devotees, the first Rasayatra was organized under the guidance of Sadguru Shree Aniruddha for two days, i.e. on September 22, 1996, and September 23, 1996, wherein many Shraddhavans participated with utmost devotion. The Sai bhaktas are well-versed with this Sai Gayatri Mantra. Sadguru Shree Aniruddha, made every Shraddhavan chant this mantra and even explained it. After this, all the Shraddhavans were provided with, a clay ball obtained from the banks of the Yamuna River, placed on a banana leaf. Shraddhavans were asked to prepare symbolic Padukas of Sai Baba from this clay. At the same time, Padukas from white butter were prepared by Appasaheb Dabholkar (Hemadpant’s grandson) and his wife Meenavahini Dabholkar as per Bapu’s instructions. The fresh white butter which called as ‘Navneet’ symbolizes devotion, and thus, these Padukas were offered at Sai Baba’s Feet. Chaubal Ajoba, who has played in the lap of Sai Baba as a child, and his wife Chaubal Aaji, offered 108 leaves of Tulsi (Basil) (that represents surrendering to God) to these Padukas on behalf of all the Shraddhavans. All Shraddhavans then offered their Padukas made from soil on top of the ones made from white butter. On the following day, all the Padukas were immersed in the Godavari river in an atmosphere full of Bhakti. The Shiv Gayatri Mantra Upasana is also referred to as the Amrit Manthan (Churning of the ocean to produce nectar) Upasana. During a war between Gods and Demons, the Gods sought help from the Demons (i.e., good and bad tendencies together) started churning the oceans to produce the nectar of immortality. Initially, this churning produced a poison called Halaahal, which had to be consumed to produce the nectar. Only Lord Shiva could digest this poison, and hence, all the Gods invoked Shiva, who himself consumed this poison and made Gods drink the nectar produced thereafter. For Shiva to consume this poison, which appears in our lives in the form of various obstacles, hurdles and ill-fate and to supply us the nectar in the form of joy, Bapu had arranged the Shiv Gayatri Upasana at 7 pm. 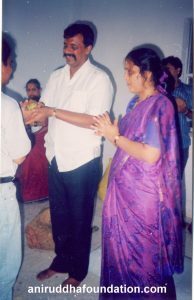 Under Bapu’s guidance, Appasaheb Dabholkar and Meenavahini Dabholkar prepared a Shivlinga. All the present, Shraddhavans were asked to chant the mantra 108 times. ’ॐ भूर्भुव: स्व: | ॐ तत्पुरुषाय विद्महे | महादेवाय धीमहि | तन्नो रुद्र: प्रचोदयात् ||’ While chanting the mantra, all the Shraddhavans earnestly prayed to Sai Baba. After the Shiva Gayatri Mantra Upasana, the Aarti (singing praises of a deity) was performed. After the Aarti, Bapu along with all devotees in unison sang gajar, recalling the great devotees of Sai Baba. At 11 pm, all devotees prayed and took darshan of Sai Baba while chanting ‘Om Kripasindhu Shree Sainathay Namah’. After dinner, all devotees got an opportunity to participate in a remarkable Satsang along with Bapu. On the second day, all the Shraddhavans visited several holy sites within Shirdi along with Sadguru Shree Aniruddha where he explained the importance of each of these sites. Bapu said that most people only visit the temple to seek Sai Baba’s darshan and return, but there are several important sites in Shirdi, which must be visited too. Dwarkamai – Mai means mother. Here, Bapu explained the importance of several articles and areas within the Dwarkamai, viz. the dhuni (sacred fire / the fire that never extinguishes), nandadeep (lamp made of earthenware), the stone where Baba used to sit, the fire-place where Baba used to cook and the Tulsi Vrindavan (Basil and palanquin). Hanuman Temple – In this temple, there are two idols of Lord Hanuman, which have been placed such that their tails join together. Bapu said these idols signifies the role that Lord Hanuman plays in one’s life, by eliminating internal conflicts and enabling us to stay firm at Shree Ram’s Feet. Lendi Baug (Garden) – This garden has a well, the water of which tastes sweet and Baba would use this water to rinse his mouth. Datta Temple – The place where Sai Baba had asked Upasani Maharaj to chant the ‘Om’ mantra. Shree Khandoba Temple – This is the temple where Bhakt Mhalsapati welcomed Sai Baba with the words ‘Aao Sai’ (Come Sai). It was after this event, Baba was referred to as Sai Baba. Kanifnath Temple – Kanifnath is worshipped as one of the Navnaths. It is said that Sai Baba would often visit this temple. Bhakt Mhalsapati’s Samadhi (Memorial) – Mhalsapati is known as one of the greatest devotees of Sai Baba. He would always be present with Baba like a shadow and was the first one to address Baba as Sai. Mhalsapati’s Samadhi (memorial) is located within his residence, and no pilgrimage to Shirdi is complete without visiting his Samadhi (memorial). Nanavalli’s Memorial – Nanavalli was a loyal Bhakta of Baba who used to live in Shirdi as a Sanyasi (Ascetic). He passed away exactly seven days after Baba’s soul left his body. Samadhi (Memorial) of Pujya (Revered) Bhaumaharaj Kumbhar – Bhaumaharaj Kumbhar was an extremely staunch Saibhakta. It is said that Baba gave him darshan in the form of a child. 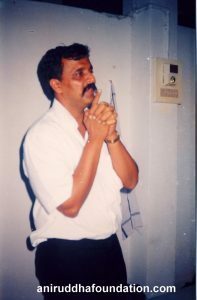 Tatya Kote-Patil’s Samadhi (Memorial) – Just like his mother, Baijabai, Tatya Kote-Patil too was one of Baba’s most loyal Bhaktas. He would lovingly address Sai Baba as Mama (Uncle). In the Sai Satcharit, it is often mentioned that Tatya Kote-Patil and Mhalsapati would accompany Baba to sleep in the Dwarkamai. They would sleep with their feet facing Baba’s Feet. Abdulbaba’s Samadhi (Memorial) – Another Bhakta of Baba, who spent 40 years in Baba’s company. In front walked the fine, copper-coloured heavily ornamented horse, named Shyamkarna, the bells on his feet jingling as he walked. In this manner, all devotees visited all sites, temples and memorials along with Sadguru Bapu. Also, Bapu himself distributed Sai Baba’s favourite fruit, guava, as prasad (offering made of food to God) to all devotees. The information and importance of various places in Shirdi helped the Shraddhavans to steadfast the Saibhakti. Bapu’s explanation of various stories and incidents in Shirdi along with their in-depth interpretation helped the Shraddhavans to understand the influence of devotion in their lives. These stories include the various incidents at Dwarkamai and other stories, which allude to Mhalsapati’s devotion, Madhav Rao Deshpande’s promptness in Baba’s service, Tatya Kote-Patil’s loyalty, Kakasaheb Dikshit’s obedience of Baba’s words, Hemadpant’s surrender unto Baba, Das Ganu’s acceptance of Baba’s words as principles, Nanasaheb Chandorkar’s complete surrender and devotion, Baijabai’s love, Laxmibai’ service and the love and affection of Shyamkarna, the Ashwa (horse) towards Baba. Shraddhavans got a golden opportunity to participate in various Upasanas and Satsang along with Sadguru Bapu. Shraddhavans obtained valuable information about Sai Baba from Sadguru Shree Aniruddha. At the end of the journey, all the Shraddhavans felt that this pilgrimage with Bapu was a journey full of love imbued in Bhakti where the foundation of Shraddha (Faith) was made firm in their lives.